Interface building and model development are both fully integrated in MyM. A MyM model is developed specifying the variables and equations, using the compact, mathematical MyM notation; setting a time-frame; and selecting an integration method (currently Runge-Kutta 1,2,4, or 5 with adaptive stepsize). After compilation, the simulator can be run using a command line or Graphical User Interface. 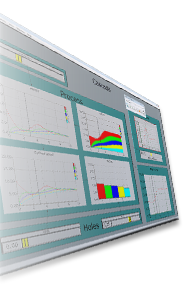 With GIM, any number of model interfaces can be easily created, edited and used. Models will have to be changed often. New theoretical insights or additional empirical data will become available. Also, if the model lives up to its promise, it will act as a stimulant for others to add extensions or revisions. MyM supports this highly iterative process. The phenomena being modelled are generally highly dynamic, with complex feedback loops and long delays that cause them to overshoot and sometimes collapse. 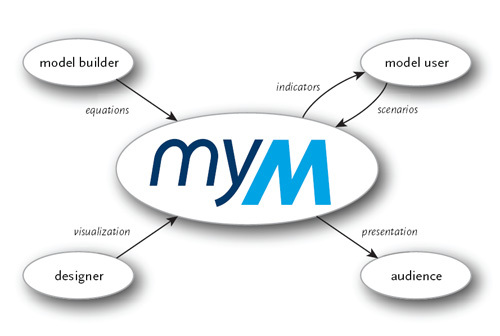 MyM uses data visualization, including the use of animation to convey these aspects. An additional way to convey the dynamics is by giving the user control over some of the parameters of the model, by direct manipulation of graphical representations. In this way users can also test alternative scenarios and engage in what-if exercises. It is not enough to show graphs of a selection of input and output data. To judge and understand a model, one needs to know its structure.